Imam Khalid Latif is blogging his reflections during the month of Ramadan for the fourth year in a row, featured daily on HuffPost Religion. For a complete record of his previous posts, visit his author page, and to follow along with the rest of his reflections, sign up for an author email alert above, visit his Facebook page or follow him on Twitter. I recently started following Ayman Mohyeldin on twitter, @AymanM. For those of you who don't know him, he's a Foreign Correspondent for NBC News and is reporting live from Gaza daily. Please keep the people their in your continued thoughts and prayers. I don't know Ayman Mohyeldin personally, but I think many of us can learn a lot from him. Ayman had witnessed the deaths of four Palestinian children playing soccer on the beach in Gaza -- Ahed Atef Bakr, 10-years-old; Zakaria Ahed Bakr 10-years-old; Mohamed Ramez Bakr 11-years-old; and Ismael Mohamed Bakr nine-years-old. Ayman had been reporting on what he witnessed that day and many days prior before he was pulled out of Gaza unexpectedly by NBC. Speculation loomed over discomfort by the network due to his approach being too "Pro-Palestinian", whatever that means. A social media campaign motivated by the hashtag #LetAymanReport grew in its popularity and lead to the eventual return of Ayman back to Gaza, where he is reporting and telling the Palestinian experience with hundreds of thousands of us all over the world. I think of what we, and so many others, would be missing had he decided to not pursue the field that he did. Our stories will be told, whether or not we are the ones doing the telling. Times like this indicate the importance of diversity in every sense of the word, including professional ambition. The conventional route of engineering, medicine, business, law, etc. and the overt emphasis on the pursuit of careers in these fields have consequences, both good and bad. I don't think an absolute framework makes sense, meaning some people should obviously pursue those fields. But in the same vein some people need to go into the arts, journalism, education, the academy, and other similar areas. 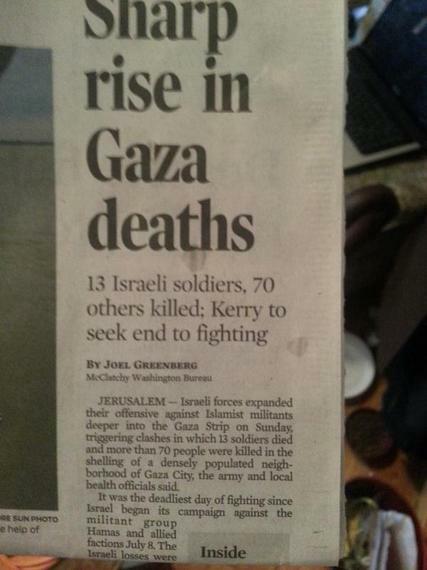 Take a look at a recent headline that describes a death toll in the current Israeli Offensive against Palestine. As one twitter user, @joshuafoust, articulated "I guess this is literally othering the Palestinians..."
This headline is just blatantly disrespectful to the sanctity of Palestinian life. It's also unfortunately the typical headline that you read, at least in the U.S. Just as the need to curtail poor journalism such as this is important so too the need to cultivate a generation of voices that offer better understanding is as important. The elevation of an Ayman Mohyeldin should not be left to chance. Simple encouragement of young people to pursue "unconventional" careers is not enough. We need to create support mechanisms to get them through the existing systems. Money needs to be invested into scholarship opportunities, internships, fellowships, and much more so that the pool is broadened and the probability of many more Aymans coming to the forefront increases. People like him should be speaking at the main sessions of different national conferences giving substantive insight on his personal narrative. Being proud of him and his sense of integrity should be taken a step further to understand how he got to where he is and institutionalize processes so that we can take our most talented young people and poise them to reach similar, if not greater, platforms. We should have 100 Ayman Mohyedin's out there -- people of any background who are willing to tell the stories that are not being told simply because it's the right thing to do. What better aspiration could we guide our young people towards than that?